I have been getting a lot of questions about Mantis Shrimp in the past, and it seems like a lot of people have been having trouble using it, so here is a series of tutorials that should get you all started with Mantis Shrimp. They are really simple and if you follow them you will get the idea about some of the things that you should look out for (no tricks just make sure that you have ghPython installed and you should be good). Did you get any specific errors? What exact steps have you taken? I can’t do anything if you don’t give me concrete information. 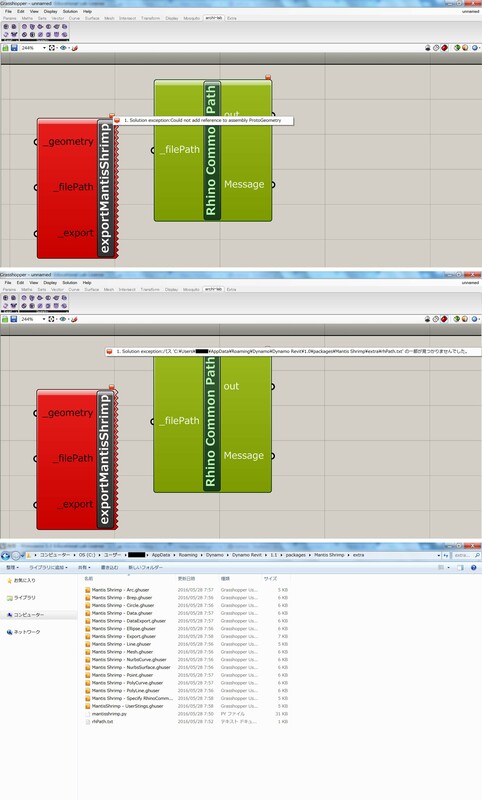 I insert the Mantis Shrimp´s components by GH and worked…. Do I have to put some dll for mantis shrimp in component foder frmo GH? I want to see it in Revit and edit…I only see it in Dynamo, how I transfer the NURBS in Dynamo to Revit???? Revit doesn’t have a very good support of NURBS Surfaces, so I am afraid that you would have to trick it into thinking that its something else. You definitely won’t be able to “modify” it freely when you do get it into Revit. The easiest way is to use the ImportInstance node in Dynamo, but that imports it as SAT file. Another possibility is to visualize it with Adaptive Components, or something like a Roof/Floor by Surface. It won’t work in all cases, but its worth a shot. Again, you will most likely have no control over it in Revit and no editing capabilities. Revit is not a very good modeling software – use Rhino/Grasshopper for that. Also, looking at your image, I have to say that you have failed in understanding the difference between how Revit works and how Rhino works. 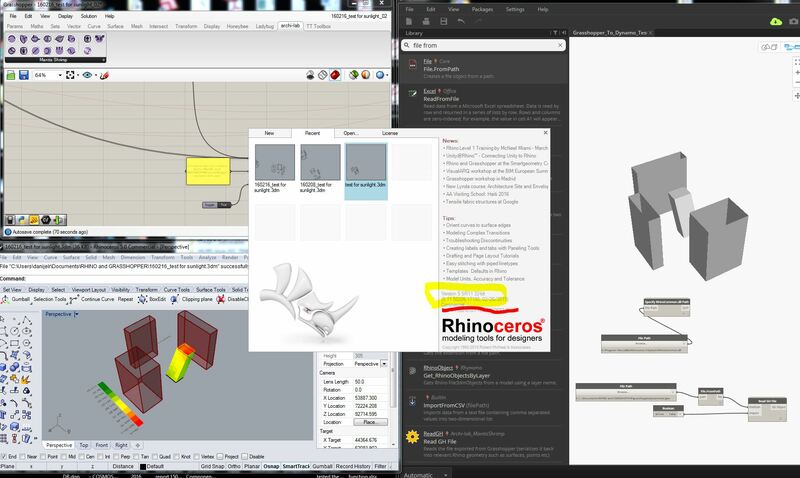 Rhino is not a BIM software, so everything is geometry (surfaces, solids, meshes, curves), unlike in Revit where geometry is just a means to visualize Information contained in Families. What you have made, is really easily translatable to something like Adaptive Components family, with two control points and a circular sweep. and then you can use start and end point of each extrusion in Grasshopper to locate it in Revit. This approach has been discussed on Grasshopper blogs/dynamo blogs so i refer you to look there for answers. Also, Mantis Shrimp and Dynamo is not needed for this task as you can go directly from Grasshopper to Revit using something like Lyrebird. Here at school we will connect a wind tunnel and I´am testing the interoperability between Rhino and Revit. The Mantis Shrimp components are showing up red in Grasshopper. The Error is – 1. Solution exception:No module named mantisshrimp. 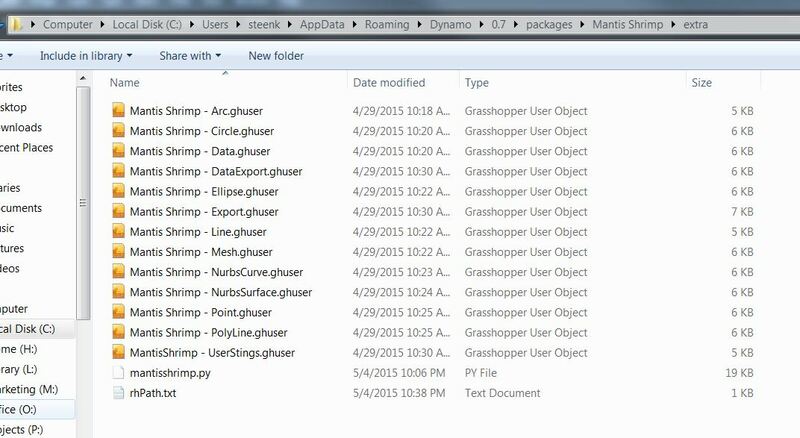 I have copied the grasshopper user objects from the dynamo package to the grasshopper user objects folder. I have also installed ghpython. Do you have any idea why I am getting this error? 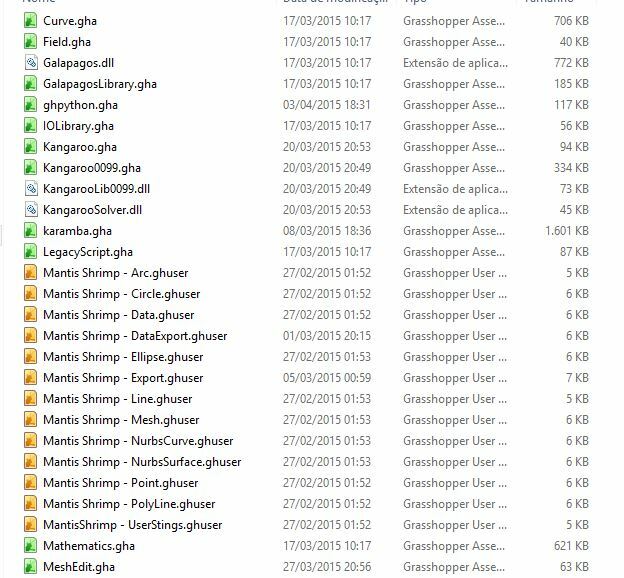 In the Extra folder where all of the User Objects were located, there was a file named: mantisshrimp.py Please do not move that file from its original location. That should fix the issue. I don’t think I moved it. Any other thoughts? Check if you have IronPython 2.7 installed. Check again if you have ghPython installed. If you did, make sure to “unblock” it. Windows by default locks all files that were downloaded and unzipped locally. It’s best to unblock the zip file before unzipping. Figured out the problem(s). Dynamo wasn’t installing the 8.0 update, so I uninstalled the previous version and installed 8.0 from scratch. I was then getting the error that it couldn’t find “C:\Program Files\Rhinoceros 5 (64-bit)\System\RhinoCommon.dll” I’m not sure if this is just my Rhino, but my file was located instead at “C:\Program Files\Rhinoceros 5.0 (64-bit)\System\RhinoCommon.dll” Just slightly different. yes, so there is a node in mantis shrimp called “specify rhino common path” or something like that. you can use that to specify a location for where your rhino is installed. I had to do that because people have their rhino installed in different locations. you can use that node to set a specific location for rhinocmmon.dll and it will work. I am glad it worked for you. 1. Solution exception:The path is not of a legal form. on the Mantis Shrimp – Export node in Grasshopper. the file path is whatever it is. It is a typical file path & I specified a .geo extension much like in your example. Can you help debug ? 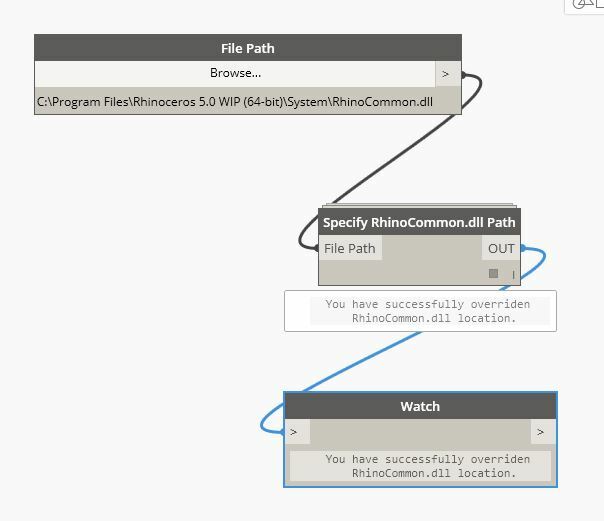 Is it due to the fact that I did not Specify RhinoCommon.dll Path back in Dynamo ? The error message is pretty straight forward. There is something wrong with the file path that you are trying to write to. Please attach at least an image of it so I can better assist you. error message says: 1. Solution exception:The path is not of a legal form. your path to the file is too long. i think windows has a limit to how long a file path can be. try saving that file at your desktop to test with. if that works then you know for a fact that its the file path. then just remove some sub-folders or rename them to be shorter. Mhmmm, in that case I would like to see which line prints the error. 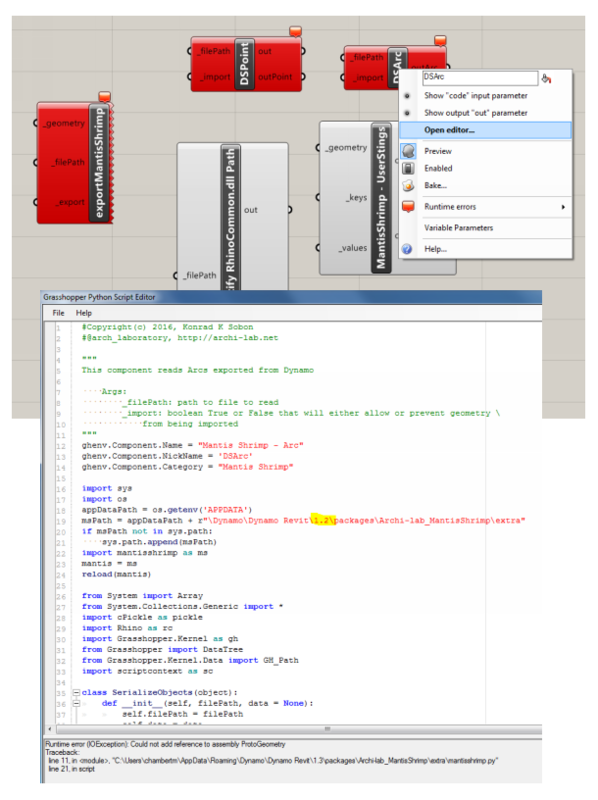 Double click the component in Grasshopper, a new window will open, hit evaluate button at the bottom and tell me what the error is that displays in the console at the bottom of the window. I am interested in knowing which path is not correct by finding out which line of code generated the error. Can you post that for me? Also, I have been noticing that if you have the old version of Dynamo installed 0.8 then it will get confused with 0.9. 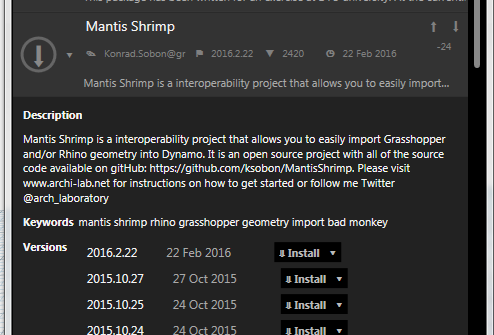 I recommend just keeping one current version of Dynamo and the latest that Mantis Shrimp was built against is Dynamo 0.9.1 Release Candidate. I would uninstall older ones, and remove all packages from the AppData folder for that version. That path looks fine to me. Like I said I have been having trouble when I was keeping more than one version of Dynamo installed. I would just get 0.9.1 and uninstall all others. I tried uploading this once before. here goes again. if it doesn’t get uploaded, I will email it to you. It’s a screengrab of the error message with the filepath in the panel window. File path is in the panel. I also just updated Mantis Shrimp to 0.9.1. Please try that! Hey I don’t think this upload attachment button is working. Two of the three export icons in your MantisShrimp palette are red on start. Not sure why this is. don’t move the Python file called mantisshrimp.py from the original location. 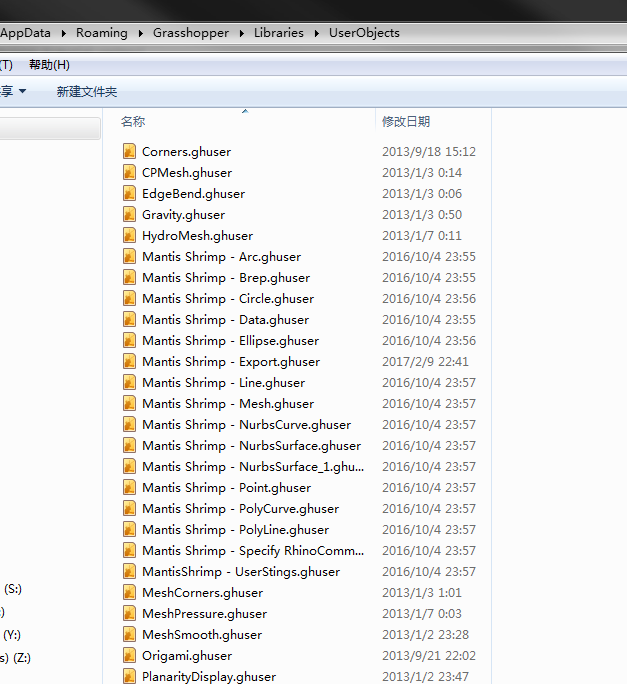 Only user objects need to be moved to Grasshopper folder. I forgot to mention that I am using Dynamo 8.0 and popped up a message when I downloaded manstis shrimp in dynamo that the version was for Dynamo 9.0. But this version apparantly doesn’t show the 3d background so I preferred to use the previous one. I see, anyway the problem seems to be on the gh side..Seems that my rhinoCommon doesn’t exist anymore? It does exist. It might not exist at the specified location. Some people have it installed in different location on their drive. To solve that close Rhino/Grasshopper and open Dynamo. There is a node called Specify RhinoCommon.dll Path. Use that node. Then re-open Rhino and all should be good. Perhaps this RhinoCommon.dll is not good.. There is a way how I could grab another valid RhinoCommon.dll ? There is no such need. You specified a Rhino 5 WIP x64 rhino common path. Now, make sure that you are actually RUNNING that same version of Rhino. What I mean is that if you now fire up Rhino x86 and try to use it, then it will throw an error. Also, same goes for already created files. If you created a GEO file using a 32 bit rhino, don’t try to open it using a 64 bit DLL file. BTW, what the heck is “WIP” Rhino version? I never seen one of those? Does it have limited functionality? Are you on MAC? No is not Mac but not the last service relase of Rhino 5.. WIP Work In Progress? 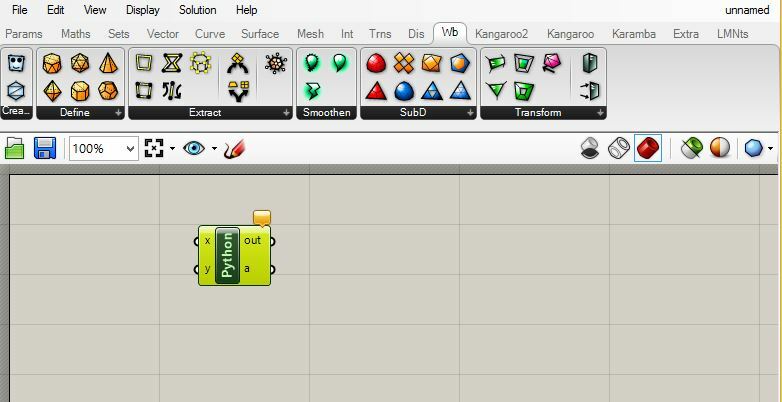 Thanks for this amazing addition for Grasshopper and Dynamo!! I think I made it work, and I believe that one of the issues was the name of the package folder in dynamo – I renamed it to ‘Mantis Shrimp’ and followed your instructions. I have a question with regard to Rhino version I am using. I have a 32bit Rhino and 64bit Dynamo and I am still able to move the geometry from GH to Dynamo. My understanding was that this is not possible. Is this something that was updated recently? If you could let me know any possible issues I could have when transferring geometry from 32bit to 64bit that would be great!! That is not an issue. I think that as long as you specify RhinoCommon.dll from the proper version of Rhino then it should work. 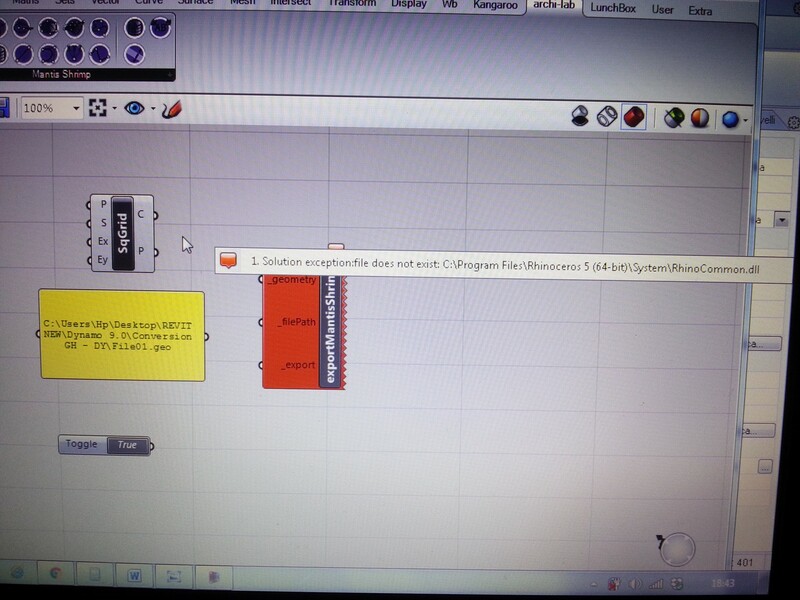 That means, if you are using Rhino 32bit then specify RhinoCommon.dll for a 32bit version. Dynamo has nothing to do with it. It’s more of a function of if you are in Rhino 32bit, your geometry is compatible with 32bit so in order to transfer it to Dynamo you need to use a 32bit RhinoCommon. I am not sure what you were trying to export, but that didn’t write correctly. Please post this to Mantis Shrimp Git Hub page, and post the sample Rhino/GH file so that I can see why its not serializing correctly. Thanks! I’m back, I installed the plugin again to use these bridge Rhino/GH to Revit / Vassari. This year I had no problems all worked out, I learned more about Revit and hope to make environmental analyzes with complex geometry with Manrtishrimp´s interchangeability . K2 Sobon is pretty cool! hahah that made me smile. I am glad you were able to figure this out. Cheers! The Mantis Shrimp components are showing up red in Grasshopper.I have copied the grasshopper user objects from the dynamo package to the grasshopper user objects folder. I have installed IronPython2.7 and ghPython. I don’t move a file named: mantisshrimp.py from its original location. what version of Dynamo are you using? I’m using version 1.1 . Seems to work very well for me except one thing: the “Export Data” GH component is missing (in the tab, and in the GH User Object Folder). I’ve downloaded the last version. Do I update anything or download elsewhere just this comp? From .py files on GitHub or elsewhere? On your demo video , you have also a little block of Tools at the left of the Mantis Pannel that miss in mine: resulting from update versions? Thanks again for your works! Export data component doesn’t exist anymore. 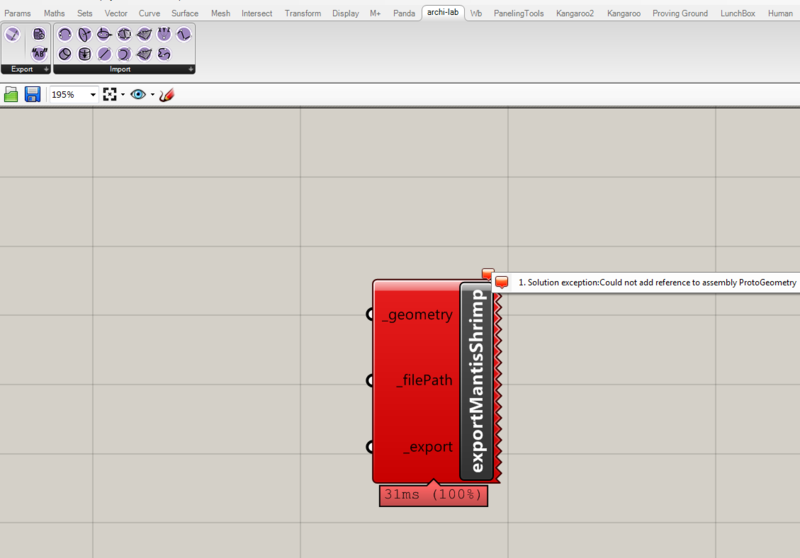 You can feed any data or geometry into Export Geometry component and it will process it. There was no need for duplication. 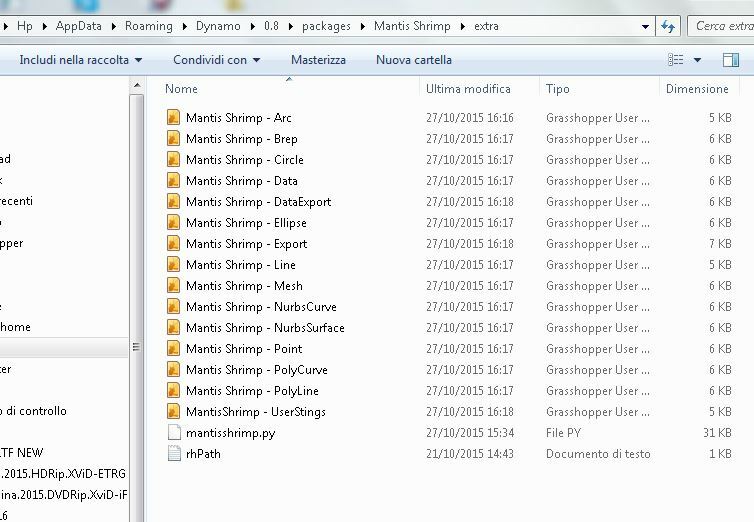 I had install the ghpython and had IronPython 2.7 installed,daymano pakages of Mantis Shrimp also ready ,then I copy the files to the GH folder, i do not get the archi-lab tools in GH layer,could you help me? This looks about right to me. What versions of Dynamo, Grasshopper are you using? I cross checked every flaws stated in the comments above, but dont know why this happens. 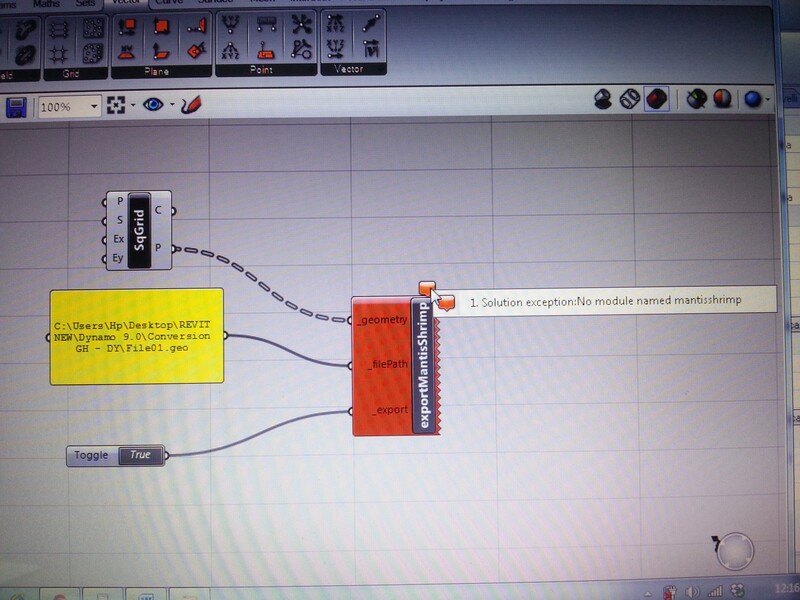 I’m using Dynamo 1.3 – I installed Archi-Lab MantisShrimp in Dynamo without any problem and I was able to created a code, but when I installed in Grasshopper the nodes show in red color, when I open the editor I saw the path is reading Dynamo 1.2 path – I was able to change it in some nodes to fix the problem but others doesnt work. Can you update the package soon? or can you tell me how to fix the problem? You should just be able to change the 1.2 to 1.3 in the file path and it should work as far as i remember. It’s been a while since i needed this for anything so i haven’t had a chance to work on this for a while now. Within GH, I was unable to find Planar Grid, not sure where to find it. 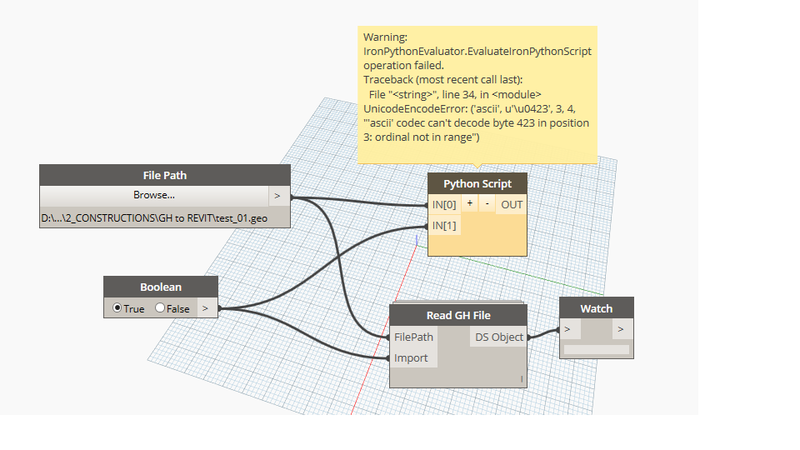 Within Dynamo, the Read GH File has DS Object as the output, not Rhino Object/s. Addendum: Within GH, I used a Rectangular Array instead of the Planar Grid. Within Dynamo, the Watch Node works fine. It’s just the GH/ Dynamo names are alittle different. I don’t know if this is important or not. Thanks again.